Arthur Andrade, a pro poker player of Tampa, Florida has won the Mid States Poker tour and collected the first prize of amount $112,990. This was the season#7 of the MSPT, takes places at bestbet Jacksonville for second time. The $1,100 No Limit Hold’em Main event attracted 421 players and generated a prize pool of $445,230. Andrade defeated David Mitchell, who took home $65,229 being a runner up of the event. Andrade total income before this particular tournament was just $14,452 playing variously but now since he won the Mid States Poker tour title, his all time earning increases to $127,442. Arthur Andrade of Tampa won the championship for $112,990.Arthur Andrade, another player from Florida takes down second spot for $65,229. The third position goes to Kenneth Kemple, and he took home $39,801. Fourth, fifth and sixth places of the No Limit Hold’em event belongs to players such as Jermaine Gerlin(32,062),John O’Neal($25,207) and Christopher Brauch(21,006). Whereas the seventh, eighth and ninth position were for Blake Whittington ($16,805),David Jackson(12,825) and Danny Romano took home $8,845 and finished at 9th position. The 10th position was for Joe DiChario, he got busted before the final table and completed to 10th spot and got $5,749, as winning share. Some notable players participated to the $1,100 Main event were WSOP Gold bracelet winner Andrew Badecker, who hit the rail after half an hour of the game took place and completed his journey to 39th place for an amount take home $2,211. Meanwhile after his removal some other top players caught in the flow and never returned such as Maurice Hawkins, completed 22nd and added an amount of $2,742 to his cash account. 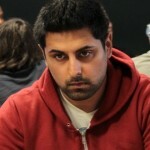 Talesh Patel, the chip leader of Day 1 eliminated to 20th place and collected $2,742 as winning share.